This treasure trove of classic recipes is the only book on conserving you will ever need. Written by Diana Henry cookery columnist for the Sunday Telegraph who was awarded Cookery Writer of the Year by the Guild of Food Writers twice in the past three years it is a complete guide to making and preserving your own delicacies. Preserving makes the most of seasonal ingredients and intensifies flavours wonderfully. Diana’s written style makes you feel she is in the kitchen with you, guiding you gently through the recipes. As you travel with her through her memories and experiences she provides fascinating backgrounds to the recipes and ingredients, whether it s the traditions of wild mushroom picking in Italy, Scandinavia and Russia or the Simone de Beauvoir (who compared making jam to capturing time). From elderflower in spring and summer tomatoes, to autumn berries and winter vodkas, the recipes in this book will provide you with season after season of wonderful preserves. "A jewel-like collection of recipes"
"Diana Henry harks back to the quietly authoritative style of writers like Elizabeth David and Jane Grigson." 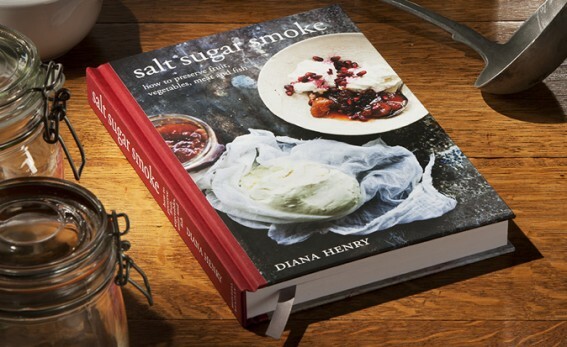 "The stand-out book of the year is Diana Henry's Salt Sugar Smoke. It does have a high concept, but it views preserving through such a long lens, and with such a generous spirit (there are absolutely loads of recipes here), that what sounds like a narrow remit becomes encyclopedic. With jams and jellies, through meat, fish, vinegar, fruit and cheese, Henry finds a preserving route into pretty well every food worth eating." "There are just so many recipes I long to try out - my copy is littered with post-its."